Owning a historic house on Nantucket is a wonderful privilege, but many homeowners claim they aren’t sure how to properly protect and preserve their old houses. NPT’s free House Interview (below and in PDF) can assist with determining what is important and how to complete appropriate renovations. This program, conducted by NPT staff and preservation architects and/ or contractors, is available to all owners of historic properties on Nantucket. The hour-long consultation provides the homeowner with a fi rsthand opportunity to learn more about the building’s style, character, defining features and evolution. We hope you will call on us for a house interview this year. Complete maintenance on a regular basis. Routine maintenance, such as cleaning and painting—especially on your building’s exterior—will help minimize rot and the need for costly repairs. Maintenance on Nantucket is especially important because of the sea air and damp winters. Consider developing a maintenance schedule and set goals and priorities. Limit the scope of repairs and keep original details. Some of the historic trim, around windows and doors and along the cornice or roofline, may need to be replaced from time to time due to rot or infestation, but replace only the portion of the wood that is damaged. This saves wood and money as well as the historic fabric of the house. If an entire element needs replacing, be sure to take detailed photographs prior to removing, and duplicate the molding profile or shape to retain your building’s historic character. Maintain the historic windows. Old windows (dating from the early twentieth century or earlier) were made to be repaired, not replaced. There is a lot that you can do to make old windows more energy efficient and be green in the process. Take special care in repairing masonry. More and more of Nantucket’s old brick is disappearing because of past mistakes. The main culprit is inappropriate use of Portland cement. Portland cement is usually not compatible with historic brick, and its use can lead to damage to the brick and structural issues. The weight of cement can also bring down an old chimney, so take care when considering chimney repairs and relining options. Repairing mortar with the correct lime mortar and cement ratio (if appropriate) is essential and should not increase the expense. It is critical to hire a mason who understands the importance of matching the mortar to the brick. Build new wings or remodel old ones with “Nantucket in Mind.” If you plan to add to your historic house, design the new addition so it is fully compatible with the main core and does not overwhelm it. Oversized additions affect not only your home but the neighborhood. Don’t build to maximize ground coverage—green space is the new luxury. Maintain the quirks. Straighten that window? Not necessarily. Leave evidence behind showing the building’s changes and its age. It is possible to stabilize structural damage and still keep those elements that give the house a real Nantucket sense of place. Treasure the things that show how your house has aged over the generations. Keep historic interior features. The interior of your house can reveal a wealth of information about its past owners; owners have a responsibility to document and maintain this important part of Nantucket history. Defining elements of the interior can include transoms (that small band of windowpanes above doorways); paneled doors; door hardware; moldings around doorways and windows and imbedded in the plaster, such as chair-rail and picture moldings. Some unique Nantucket features such as old mirror boards (moldings or woodwork between windows) also tend to have remained in many old houses here. Perhaps one of the most common historic features that is often removed is a winder staircase. 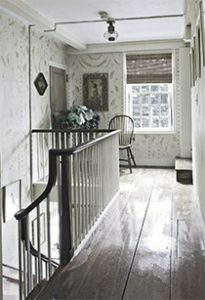 Winder staircases have served most historic houses on Nantucket for centuries and are beautifully constructed. For some, these staircases are hard to manage, and we suggest adding straight-run stairs in new additions, if necessary, and retaining the historic staircase. Keep your plaster walls! This often comes as a surprise to many homeowners, since plaster has been routinely torn out, even by well-meaning preservationists. In recent years, most preservation contractors know the benefits of retaining plaster walls and repairing them, and if necessary replacing sections that are in poor condition. Plaster is a remarkable material that is superior to modern drywall (ask any craftsman). On Nantucket, which has a lot of moisture, plaster is the material of choice since it can get wet, provides excellent soundproofing, and can be repaired. Architectural historians know that old plaster can reveal clues to the building’s evolution by showing the location of old walls and other elements. Plastering is definitely a craft, but the island is fortunate to have skilled contractors who can complete this traditional building technique. Take special care with your historic wood floors. Fortunately, most people want to retain the old floors in a historic house, but there is a right way and wrong way to care for them. All too often old flooring is over-sanded, reducing its overall life span and at the same time destroying its antique character. Old floors were hand-planed, and hand-sanding is the best way to retain their character. Simple cleaning and waxing can also do wonders and will retain the old patina. Do your homework and ask questions. Owning an old house can be challenging, because dozens of issues arise during your ownership. It is not always easy to find the correct material, method, or person to work on your home, and sometimes the answers are hard to find. We suggest researching online and asking questions. Beware of the contractor who says that preservation is not an option or always costs more. Get another opinion. Fortunately, Nantucket has craftsmen who work with historic fabric and understand that doing things the right way usually doesn’t increase costs.